Palm Sunday, a visit from Two “old boys” who sang during the 1950’s! 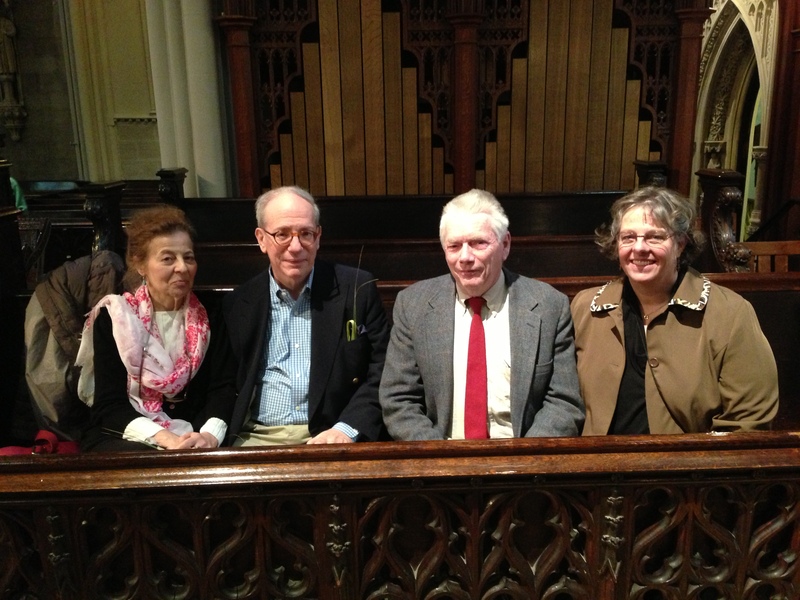 On Palm Sunday, Two Choir Alumni and their wives were in the congregation. It was so wonderful to welcome them home and catch up on what they have been doing, see where they sat in the choir stalls and hear about choir life during their time! Douglas Sheer wrote this email after the visit, I thought it would be nice to share it with you all! Robin Monahan and I were deeply moved by the warmth and enthusiasm of your welcome at Grace this past Sunday, as we — two returning 1950s era choir boys — visited the church on Palm Sunday. As 1950s choir boys under Ernest Mitchell, from 1953 to roughly 1957, we were among other boys who included: Allan Ringland (our frequent soloist), Toby Thornton, Curtis Deyrup , Andy Platt, Nigel Watson, Dan Krevere, George Laird Monahan (Robin’s older brother) and Emlyn Williams to name a few. Mr. Mitchell was a consummate musician and tough task master. Rehearsals took place Tuesday and Thursday afternoons, early Friday evening, Saturday mornings and Sunday mornings. There is a great photo that appeared on the front page of the New York Herald Tribune at Christmas of all the boys. We will forward that to you. Some of us were also members of the Young Person’s Group, that was headed by assistant minister, Rev. Michael Allen, who later became minister of St Marks in the Bowery. There I met John and Tom Harriman (distant relatives of the Governor and Ambassador) who became friends. Some of the choir boys also attended Grace Church Camp, as I did, and some were students at Grace Church School, as Robin was. The choir room had wooden lockers, all around, for both the boys and the adults. At Christmas, Mrs. Monahan (Gene) would host the boys in a marathon cookie making and decorating binge, then we would place the tin boxes in each locker as a treat for the entire choir. This was an annual tradition. Jan Beyea, an Optimus in 1949 and 50 was also a friend, even though a bit ahead of us in his choir days. Years later I met him again and Jan has been the senior scientist of the Audubon Society and is consulting ecologist today. Our choir days were very meaningful and enriching to us and those feelings remain strong. It was a delight to have the chance to revisit the church and to have your personal tour. We will remember your graciousness and welcome.